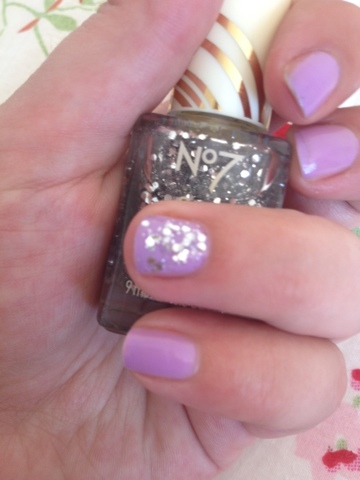 I picked this up in Boots this weekend, using my £5 off No 7 Voucher meaning that this Glitter top coat only cost me £3 - Bargain!! I picked up the silver version of No 7 Stay Perfect Glitter Top Coat but I think I may have to go back to pick up the Gold version as well after trying this one out. It's really easy to apply and gives full glitter coverage after 2 coats. I saw a preview of these on some blogs a couple of months ago and got very excited, I do love glitters especially chunky glitters. This comes in a see through square bottle with a cream lid with gold detailing, it looks really pretty actually in the bottle, it's a clear polish with tiny pieces of silver glitter and then bigger hexagonal pieces. It has a rounded brush, similar to Rimmel and Essie Brushes which means one stroke covers the whole nail for me. I couldn't wait to test this so I applied 2 coats on my ring finger over my much loved Barry M Berry Ice Cream (still haven't fallen out of love with this btw!!) and I actually really like the 2 colours together. 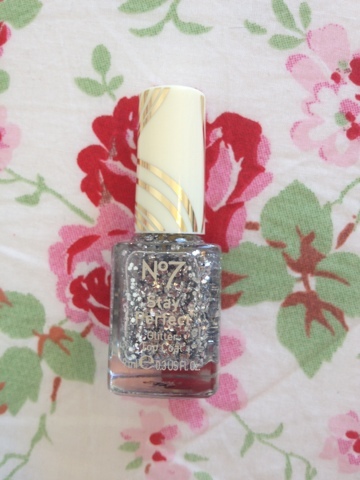 This was the last bottle of the silver glitter left in my local boots, it seems to be selling out pretty fast, so if you like I'd recommend grabbing it soon! Have you guys tried this polish? 3 comments on "NOTD: No7 Stay Perfect Glitter Top Coat"
I almost picked this up the other day, I think I will when I get more vouchers.